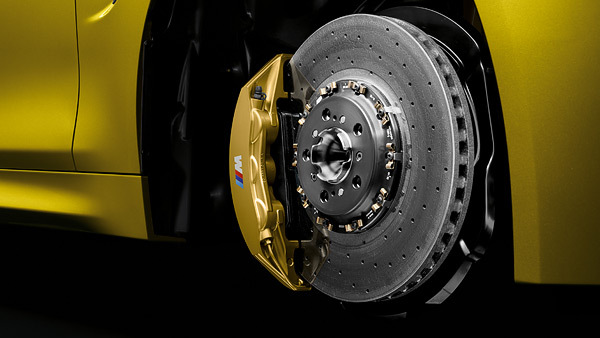 The BMW carbon-ceramic brakes are supplied by Brembo, a well-known brand to supply braking components. First introduced with the M6 in 2012, BMW has equipped the carbon ceramic brakes on the M5, M3 and M4, and customers of these cars often ponder whether the BMW’s trademark golden calipers worth the extra cost? Lightweight: 12.5kg lighter than standard M3/M4 brakes - lower unsprung mass means better acceleration and handling. No disc corrosion - low mileage cars equipped with standard brakes that have not been driven for an extended period will have corrosion on the discs because the minimum load level required to start a brake disc’s self-cleaning mechanism is never reached. However, Ceramic Brake discs are not as susceptible to corrosion because rust films do not form on the friction ring constructed from grey-cast iron. In addition, the new M Carbon Ceramic Brake disc’s friction surface is covered with a stress-relief coating. Long life span - its said that the M Carbon Ceramic Brake disc can last the service life of the vehicle in ideal everyday driving. Over time, oxidation of the carbon fibers and sporting driving styles can cause the brake disc to lose weight and strength. Sounds all good right? Well not exactly ... Besides the fact that the price tag of these BMW Carbon Ceramic brakes cost as much as a whole used BMW E46 M3, they are annoyingly squeaky when cold, and the long life statement that is untrue. Alan from the United Kingdom owns a 2014 BMW M4 with just 17,000miles and it is equipped with the M Carbon Ceramic brakes which have already failed on him, and severely as you can see in the photos. That is less than 90miles a week and its already suffering from premature front carbon disc failure, as the discs have flakes coming off leaving it with an uneven surface. The car has been classified unsafe to drive, and he has the cost and shame to get is car towed home. You would think that spending premium on one of BMW's M flagship cars would give motoring free worries, and with the unlikely event of a problem occurring BMW will step in and make things right, especially when you opt for the extended warranty such as what Alan has done. However, it's all downhill as BMW (Coopers Sunderland and customer complaints in BMW HQ) refuses to step in and replace the prematurely failed discs under warranty, and only has offered 10% of the parts which is an insult as with further research finds out that the community can get him the very same parts at an ever lower cost. The only policy BMW carries regarding brakes is 12,000 miles or 2 years for warrantable parts. Just for a single carbon ceramic disc will set you back over £2000, and is it really worth all the above advantages? Would you just swap everything to a more reliable standard steel and as capable setup that cost the fraction of the price? Alan is not the only one facing this issue as there are other ongoing legal suite in the USA for the same problem. The case is based that the issue was in a manufacturing defect and thereby violated BMW’s warranty. Furthermore, they can cause a substantial safety hazard and is a substantial consumer injury.